Tuck Pointing, Brick and Chimney Repair Toronto | Turnbull Masonry Ltd > Blog > Blog > TuckPointing in Toronto: Are Your Bricks In Need? Tuckpointing in Toronto is an essential service you will need at some point to prevent costly damage of your brick structure. Toronto winters are harsh, cold and rather wet, all things that can wreck havoc on a brick structure. The bricks themselves can stand up to the challenge but the masonry joints holding them together will eventually start to show signs of wear and tear. Masonry joints are incredibly important to the overall stability of a brick wall, if you notice any cracked or crumbling mortar you may need Toronto tuckpointing services as soon as possible. Tuckpointing can be applied to a couple of bricks or only one brick. Usually, an entire wall does not require tuckpointing and if it does the damage may be extensive enough to require a complete or partial rebuild. Tuckpointing includes completely removing any damaged mortar and thoroughly cleaning out the joint area. Once the joint is cleaned and prepped a new layer of mortar is applied in its place. Mortar varies in color and appearance, which is why it’s important to have a trusted professional out to do the job. The last thing you want is mismatched mortar, or an unsightly tuckpointing job. Mortar also varies in strength and if you have different strengths of mortar it will apply uneven pressure to areas of the wall, eventually messing with overall stability. This is why finding just the right mix of mortar to match the strength and appearance of original mortar is very important. Tuckpointing can be used for walls, chimneys or any brick masonry structure. If the masonry mortar joints on your brick chimney are showing signs of damage, or if you find loose bricks around the outside of your home, tuckpointing is a must. The purpose of your chimney is to filter out toxic fumes and smoke and so it’s nothing to mess around with. If the stability of your chimney is at risk so is the safety of your home when the fireplace is in use. If your chimney’s masonry joints are cracked or crumbling, or if entire bricks have come loose there could be underlying problems that need to be addressed. Otherwise, a chimney fire could spark, or toxins like carbon monoxide could find a way into your home. -Cracks in the chimney crown. Chimney crown cracks are a leading cause of masonry leaks. The chimney crown is made to prevent water getting inside but if it becomes cracked water can drip right on in. Water damage can cause weak mortar joints and the need for tuckpointing services. -Cracks in mortar. If you notice cracks in the mortar joints holding your brick chimney together you need to call out a professional right away. Chimney mortar will deteriorate faster than mortar on other parts of a building due to its positioning on top of your home, which leaves it more vulnerable to wind, rain, and other elements. -Efflorescence build-up on bricks. 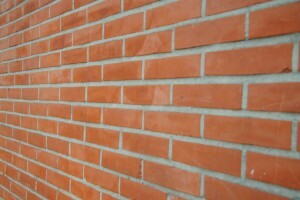 A salt stain, or efflorescence, is a sign that water has penetrated through bricks. When water finds a way between the flue of your chimney and the actual masonry structure efflorescence will appear on the exterior of your chimney. Without treatment this will eventually cause spalling, or complete loss of bricks, to occur. Tuckpointing will save you money and hassles in the future. The key is to notice the first signs of necessary tuckpointing services. Carefully inspect brickwork, paying close attention to the mortar joints running between each brick, knowing that at some point all mortar will require touch-ups. -Small pieces of mortar that have chipped out or come loose. What Happens If You Ignore Cracked Or Crumbling Masonry Mortar Joints? The last thing you want to do is ignore cracked, crumbling or altogether missing mortar. The mortar holds your structure in place but it also helps keep out bugs, water, weeds and other intruders that can weaken an entire structure over time. If mortar damage becomes too bad the entire structure will need to be taken apart and rebuilt. This is going to cost you a lot more money than a simple tuckpointing procedure. The biggest problem facing mortar joints is water. If water has a chance to penetrate it is going to freeze and expand, especially in Toronto’s notoriously cold winters. This process causes the bricks and masonry to contract and expand, creating larger holes and surface gaps. Over time unaddressed water damage will cause spalling, mold and many other problems to form. Tuckpointing services provide the solution you need right away to stop more costly damage from building up. For over twelve years Turnbull Masonry has remained the trusted go-to for all Toronto tuckpointing services.